Adele is the latest celebrity to be created in wax by specialists at Madame Tussauds. Here sculptor Louis Wiltshire works on the clay head that will be used to create the wax mould for the star's new wax figure at Madame Tussauds in London. Work is now well underway on the Oscar Winner's figure which will be portrayed in a dramatic performance pose at the London and Amsterdam attractions in July. 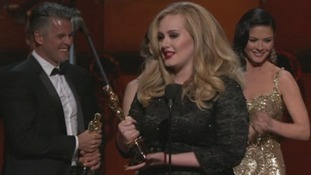 Read: Adele dedicates her Golden Globe for Best Original Song to her "lovely son". British stars have been honoured at the Golden Globes with Adele, Dame Maggie Smith and actor Damian Lewis all collecting gongs. The BAFTA nominations were announced today - our Entertainment Correspondent Lucrezia Millarini runs us through featured Londoners. West London born Dame Helen Mirren is nominated in the Best Actress category for her role in Hitchcock - playing the wife of the famous filmmaker. Dame Helen Mirren said she was "delighted" to have been nominated for Best Actress for her performance as Alma Reville in Hitchcock. This was a wonderful role, Alma Reville was more than Hitchcock's wife, in many ways she was his muse, his assistant, his editor and more, and I am proud to have had the opportunity to portray her. There were many people involved in the making of the film, all of whom played a part in this nomination. I would particularly like to thank my co-star Anthony Hopkins and our director Sacha Gervasi who helped me to shape Alma on to the screen.